Office Space - Bacolod City, . 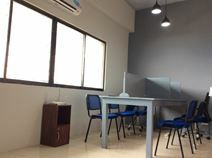 A fully-furnished co-working space. The open plan office creates a light and airy feel and there are large windows offering plenty of light. Air conditioning keeps the centre at a cool and comfortable temperature. Banking services and an ATM are accessible. There is a well-equipped kitchen and a cafe/ restaurant onsite, perfect for when you forget your lunch! Hot-desking options are also available. Situated in the centre of Roxas City, close-by to many establishments, such as; Villareal Stadium and Provincial Park. There are many tourist attractions located nearby, which you can explore during your stay. In the surrounding area there are several schools and a University. There are also a number of restaurants moments walk from the space.